Furniture defines the opulence of your office space. One black spot and your pride is gone for a toss! We know your sofa, carpet, chairs and other office furniture is exposed to constant wear & tear, dust, pollution etc and The Maids.in are here to deep clean them all. Monitor and clean the upholstery. Clean and spotless to demonstrate a refined and hygienic lifestyle. Complete refurbishing upholstery cleaning experience. Remove dust, food crumbs, stains and blemishes. Extend the life of your office furniture. Surfaces vacuumed/ under cushion area also cleaned. Professional Office Sofa Cleaning, Chair Cleaning & Carpet Cleaning Services for Your Business!!! With 30 years of experience in cleaning residential and commercial spaces, we use our expertise to design custom solution to clean the dirtiest of carpets, rugs, upholstery and floors. For office sofa cleaning or carpet cleaning services, we use advance vacuum cleaners and upholstery cleaners to perform these tasks, efficiently. Our proprietary vacuum cleaners use HEPA filters that trap 99.97% of airborne allergen. These filters can trap microbes as small as 0.2 microns. We remove dust particles and germs when vacuuming the carpets, chair, sofas and other furnishing items. Our cleaning experts are meticulous about cleaning every room inside your office. We vacuum-clean the underside or backside of each chair/sofa. We also clean the window blinds when vacuuming the furnishings for that perfect sparkle. To clean roman-blinds, curtains or carpets, we use proprietary upholstery cleaners from Manmachine Group. These machines dry-clean the furnishings, without the need to dry the upholstery. We use the extraction method to remove stains from the curtains, sofas or chairs. Unlike the hot-water extraction method, this process does not wet your furnishings. You may use the clean rooms immediately after our service. We use motorized rotating brush for office carpet cleaning as it opens the fibers, and the cleaning liquid can move deeper, form strong bond with the dirt particles and pulls them out easily. We can easily remove all stains after this treatment. We use eco-friendly cleaning products to remove stains or dirt particles from the fabric. We complete office chair cleaning service and other tasks within a reasonable timeline. 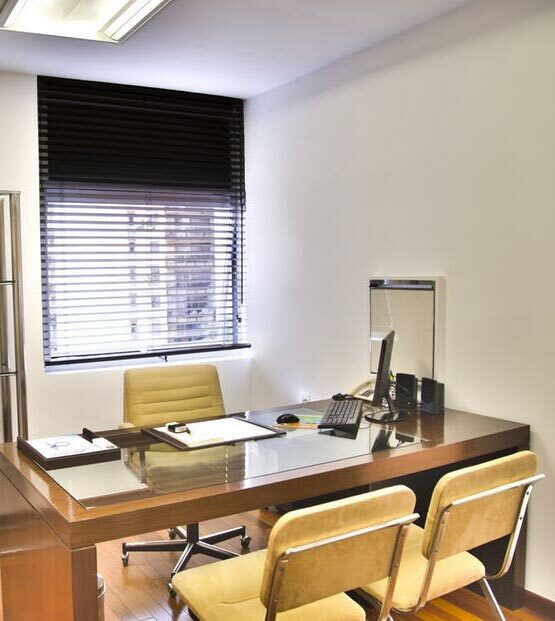 We clean your office silently in the background without disturbing your work schedule. Discuss your requirements with us Today!! !